It's not theft if you have to fill out a form! This quick post is a kollektive reminder why and how we should celebrate the glorious day of progressive, massive, state-sponsored redistribution of other people's money (OPM), and be thankful to the Party, the government, and our Dear Leader, as well as the heroic IRS workers who selflessly toil every day on taking OPM from the pockets of The Rich™ and giving it to the Government, which then gives it to those among The Poor™ who vote for Dear Leader. * It is strongly recommended that you forget that the original Robin Hood robbed from the Sheriff who collected taxes for the government, and then returned the money and the confiscated food to the taxpaying peasants. I believe in tax fairness. I had to pay over three million dollars in federal taxes this year. I think everyone should have to pay over three million in taxes. This plan, which I call The Fair and Equal Tax Plan, will boost the economy over night as everyone will have to work hard to pay the tax. Everyone all my life has told me my high taxes help the economy by making me work hard to meet my tax obligations. My plan is to expand that simple idea to help the entire country really grow. If you're lucky enough to have a calendar, you'll know that today is one of our most beloved holidays - TAX DAY! Not only does this mean that the State gets more money to help with the Revolution, it also means that we get to toss more of our money at the State. I love tossing money at the State so much, every week I go down to my local post office, toss a crumpled-up ball of money at the clerk, and tell him to give it all to the government. I hope that the State appreciates my sacrifice, and I hope that the post office guy is having a nice time with his new Bel-Air that he got. I dunno how he got it, but it's really nice, baby-blue too! Please, komrades, donate all your money to the State. There's a line on the 1040 form for donations, and if you could toss even a dollar at Our Glorious People's State, I'm sure that your ration status would be improved. I've donated so much that I'm eligible for 14 bottles of Beet Vodka per day! And while I'm thinking of donations, why aren't you donating to Our Glorious Party Organ!? You know very well that we've been getting less money from the State after our Glorious Direktor was caught buying foreign beers and Russian brides with 3/4 of the cash! And we just HAD to be ratted out by a midget in a squirrel suit, I could've SWORN it was Craptek! If only Komrade Direktor hadn't kept our Party Organ's servers in his shower instead of a proper locked server room, we might've still been getting 100% of the amount we're entitled to. Anyway, point is you MUST donate to The Kube, otherwise Direktor Square will have you put in a small cell on the basement level. And you might not even get that lucky. You know, Tax season is a magical kind of season. The cash flies through the air, everybody goes door to door singing Tax carols, it's so heartwarming. Just today I had two wonderful Young Pioneers come to my door asking for donations to the government. I told them that I already donated to the government, and they gave me a nice medal they made out of a piece of wood and a safety pin. I gave them a bottle of Beet Vodka and sent them on their way. But yesterday I heard that come people DON'T like paying tax! I can't even begin to imagine anybody who wouldn't like paying tax! Let us all celebrate this holiday like we celebrate all holidays: With Vodka and Revolution! "It is a good thing that we do not get as much government as we pay for." "If you make any money, the government shoves you in the creek once a year with it in your pockets, and all that don't get wet you can keep." "Alexander Hamilton started the U.S. Treasury with nothing and that was the closest our country has ever been to being even." "This is too difficult for a mathematician. It takes a philosopher." "Congress can raise taxes because it can persuade a sizable fraction of the populace that somebody else will pay." "Be wary of strong drink. 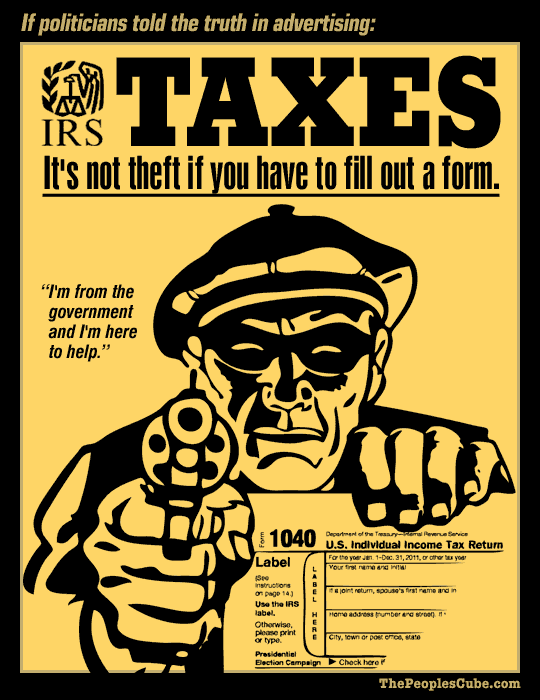 It can make you shoot at tax collectors... and miss." "A liberal is someone who feels a great debt to his fellow man, which debt he proposes to pay off with your money." "The point to remember is that what the government gives it must first take away." "If the Lord loveth a cheerful giver, how he must hate the taxpayer!" "What is the difference between a taxidermist and a tax collector? The taxidermist takes only your skin." "The wages of sin are death, but after they take the taxes out, it's more like a tired feeling, really." "The nation should have a tax system that looks like someone designed it on purpose." "All the Congress, all the accountants and tax lawyers, all the judges, and a convention of wizards all cannot tell for sure what the income tax law says." "When there's a single thief, it's robbery. When there are a thousand thieves, it's taxation." The error has now been korrekted. The guilty have been punished with various sentences (3 to 5 years) in the Gulag. Well, Red, it's been nice knowin' ya. We'll all miss you in the Gulag. Hope you get out without too many injuries or psychological problems. Tax the roads that he must pass. We'll still be after the inheritance tax! Comrade Guard, you keep using the personal possessive pronoun "His." This is wrong on many levels. The first and most prominent is the notion that this person actually owns something. Even the Utopian Socialists who preceded Marx and Engles understood that property is theft. You are guilty of promoting the thought crime that an individual can own something that by rights belongs to the collective. In our beneficence we allow people to posses goods, but we the Party Elite actually own them. In the name of the People, of course. Your second great error is the use of a male pronoun, furthering the unacceptable patriarchal Western paradigm of the existence of separate genders. A correct poem is gender neutral; art must be subordinated to social needs regardless of the damage it does to rhyme or reason. You stand corrected. Now go stand you post. On the windy side of the Kremlin and without your thermal undies. From the windy side of the Kremlin and without any undies, I stand corrected. However, if the Party Elite were to review the post, the Party Elite would find that the poem was written by Author Unknown, an obvious capitalist pig and bigot of likely trans-neutral-jenner. It was written prior to the Reign of our glorious Dark Knight in the White Rainbow House Hut. So, as you can see, I have no poetic talent from my kommon kore edgukation and none of the rebuttal from my crime rhymes. A point that might be well taken, comrade, had I not already assumed the moral high ground and a hectoring tone in my previous communique. We on the left do not acknowledge logic in any form. This poem appeared under your name. You posted it, even if you did not write it. Therefor, you must agree with everything in it and everything the author of this poem believes. Since the poem has no known author, it could have been written by anybody. Hitler could have written this poem, or George W. Bush! That means you embrace everything that Hitler and George W. Bush ever said or did. See how much more fun and self-righteous life is when logic gets a bullet in the head from the Thought Police? Now, if you don't agree with me in every way, I shall, with no logical evidence whatsoever, denounce you as a racist and an ungulate. April 1: The People's Cube is twelve years old! The New People's Airlines: Save Time, Money, and Climate!